I laughed typing the title of this post, and really I need to call my previous boss to apologize to her. I can remember popping into her office frequently because I had questions, and she was always welcoming and helpful. This is the same tone that I have with my faculty and staff, but I had no idea how busy the principal’s office actually is! Wow! In the principal’s chair, I’ve learned that there are people that want you and people that need you. The people that want you need confirmation, and the people that need you actually need your help. Part of our job as leaders is centered around building capacity and building the confidence within our people to make the right decisions. As we build capacity throughout the building, faculty need the principal less and can rely on one another for guidance and support. It’s an interesting point because as principal, one wants to be in the loop of what’s happening, but it’s also important to learn to trust those you have poured your leadership into.This is one of the first things I learned during week one of my new job. It’s one that I’ve noted in my notebook along with many others I’m sure will come as we go throughout the year. Week one as principal was unlike anything I could ever expect. I relayed to the administrative team that we move when kids move, a point I noted after meeting with the teachers last year, and I also wanted to enforce this because kids enjoy seeing us in the hallway. I was trained to be seen looking, and I know the teachers appreciate our visibility. The students act a certain way because they know that we could pop up in the hallway at any time, and I’ve also given the expectation that they have their agendas when they are in the hallway without a teacher. Accountability, relationships, and perseverance. They seem like three easy words to master, but they aren’t. The important part is once they are in place for everyone in the school building, we’re able to move and overcome barriers. After the movement happens, sustainability is the goal. That’s where real change happens. In reflecting on my past two weeks as principal, I have to do a flashback to our grade level assemblies with our students. This was probably a standout moment of week one for me as principal. I knew that the students didn’t know me, and honestly I didn’t know them, so this meeting was going to be very important for me to communicate what I expected from them this year. I gave the students a breakdown of our behavior expectations. 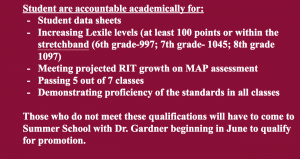 Along with that, we also gave students expectations for promotion. This was the point in the grade level assemblies where everyone stopped whispering and everything became SILENT. They were listening. They wanted to meet the standards that I’d set because to not meet them meant one thing- they’d have to spend their summer with me. That resonated with so many students, and all they wanted to do from that point was to understand what the expectation was and know how to meet the expectation. Afterwards, I had a meeting with some of the 8th graders to clarify some major points, and there was also a meeting after the meeting with more students who were excited about joining the leadership academy. 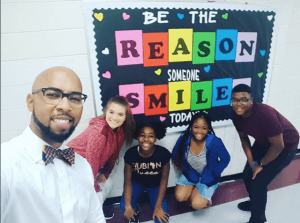 We took a picture in front of the “Be the Reason Someone Smiles” bulletin board because that’s what they were doing. I asked them what was going on, and they couldn’t contain their excitement. They were excited about the leadership academy. They were excited about the extracurricular opportunities. They were excited about all the things I’d said, and it was during this moment that they began to reflect on what they’d done before. They could see that mediocrity wasn’t enough, and as a principal, I knew that this was a moment I needed to remember to get me through the year. I had to take a photo with those students because they would be the hope and inspiration I needed to keep moving forward, even when I was overwhelmed or didn’t feel like doing something. That would be the picture I took a look at. BE THE REASON SOMEONE SMILES! It wasn’t just what I needed for the moment, but I knew then and know now that it will be something I need throughout the year, and I’m thankful they obliged to my request. Week two had it’s own challenges, but it was still one that was smooth. My new team and I worked through new challenges, mainly with scheduling, and the bulk of the issue hadn’t even hit us yet. At one point, one of the teachers said, “Dr. Gardner, you must take medicine or something because I have no idea how you remain so calm all of the time.” But, that’s how I am when I think. When I have a tough decision to make or when I’m trying to think through how to make something happen, my brain shuts everyone else out and thinks through the situation. It appears that I’m there, but really I go to this internal space to think it through. The clear sign is when I take my glasses off and rub my eyes. That’s when deep thinking happens and what I have to do most times to make tough decisions. I can’t pass the buck any longer, and so far it’s helped me get to the right side of a tough decision. 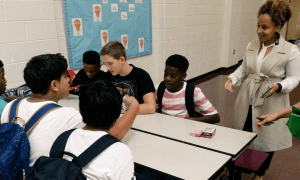 Anyway, during week two we kicked off our PBIS Redemption days where students could redeem Cougar Cash they’d gotten for positive behavior, and they had a chance to purchase items from the PBIS store, or they could rent UNO cards and games to play with their friends. I didn’t have a chance to experience it because I had a meeting, but the Assistant Principals and Coaches were able to pull it off. I can remember texting them, and they’d responded by saying that the kids were having a blast and that Mr. Ray was having the kids listening to the rock band, Queen. At that moment, I smiled, and once again I was reminded of why I do this work. It was for the kids. As adults, the work we do doesn’t always feel good, but it’s because we get overcome with the emotion that’s tied to our jobs. It’s because things don’t seem to go the way that WE want them to go. It’s not about us, though. It’s about the kids we serve. That’s why we have a job to begin with. We were never given the job of educating kids for our own profit or feelings. If anyone believes that, then they are in the wrong profession. I’m convinced that this job is a calling. Many try it, but only those who are truly called to do the work make it through. As I reflect, I also think about the funny things that have happened behind closed doors with the admin team. The most notable thing would probably be Mrs. Aragon becoming excited that she had a salad from the cafeteria without even asking. She said, “The best salad in the town of Griffin comes from the Cougar Cafe’. ” I’m certain those ladies would love to hear that. I think about the student who diagnosed himself with all of these symptoms, and I think about the incident where Coach B asked the student who was cuter-she or I- to ensure the student was ok. I think about the many fist bumps I’ve given students throughout the week and Coach Wilder saying, “Dr. G., man, that suit is fly! We gotta start calling you Mr. G.Q!” I think about the experience I had with SPED department this week and how one of the students gave Mrs. Tucker a big hug when he saw her after getting in trouble. I think about the student who told Ms. Fowler, “Yes, Ma’am” after I had told her five minutes before that I expected her to show respect by saying “Yes, sir,” and “Yes, ma’am.” Those moments have already began to define my principalship, and as we grow together there will be even more stand out moments that will get us through anything that comes at us. Earlier this week, I sent the faculty and staff an email that spoke of our links as a chain. Chains aren’t broken easily, and that’s what we are- not easily broken. We’ve had a lot of newness and a lot of procedures that have caused some teachers to feel tired, overwhelmed, and maybe confused at times, but it’s all part of the change. It’s all part of the process. We’re revamping and putting ourselves in a place where we can make big moves. We’re expecting miracles…big miracles…and mediocrity is a thing of the past. We are Kennedy. We are Cougars. 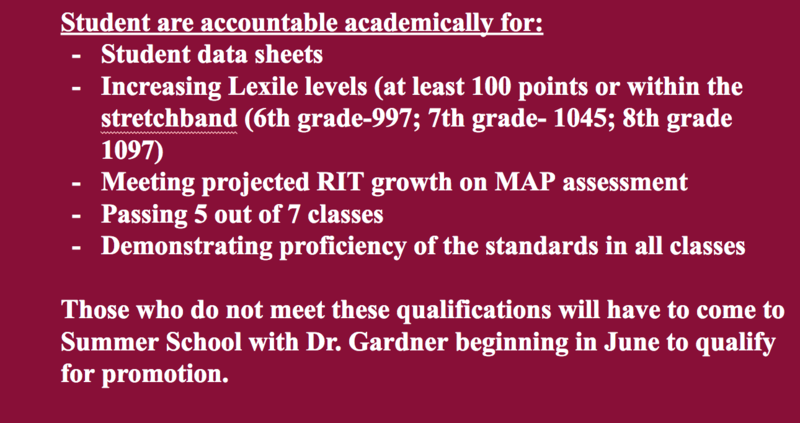 We are Accountable. That’s just what it is, and I would have it no other way! Next Post That Ain’t Normal…By Any Means. As a GSCS Board-member elect, I enjoyed reading your blog about your first 2 weeks. As a 30 year Georgia educator, I certainly could relate to many of the things you mentioned. I look forward to meeting you and visiting your school. I follow you and all the schools on Twitter and it has been exciting to read all the posts. Keep up the great work and thank you for your passion. Have a good weekend. It is amazing to see how much you pour into your faculty, staff, and students! And this is just the beginning of the year. Can’t wait to see everything that happens at Kennedy Road. Nice points about the journey!! Take time to enjoy the ride!